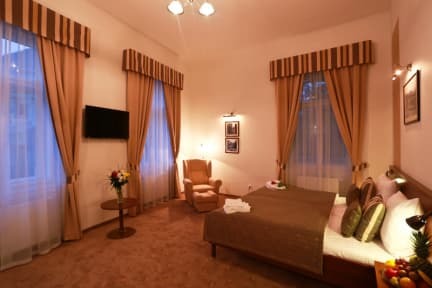 Hotel U Svatého Jana, Praga, Czechy : Rezerwuj teraz! 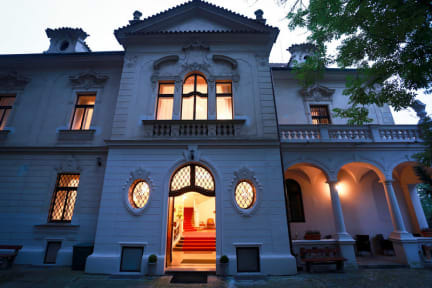 The building from Hotel U Svatého Jana is from 1906 and originally was used as a vicarage for the Church of St. John. The hotel has 15 rooms with capacity of 40 persons. Hotel was completely renovated in 2014. The hotel has also a parking place for 5 cars and a beautiful flower garden. The reception desk is situated in the ground floor and works for 24 hours. Throughout the hotel operates Wi-Fi. Hotel U Svateho Jana has a vary advantageous location right in the centre of the city. It´s just about 10 minutes walking to the Wencelas Square and just 1 minute walking to the Charles Square. There is the stop of the B - subway line as well, it is about 200 meters from hotel. A tram station is just about 30 metres from the building. Prague Botanical garden is situated 150 metres from the pension. The hotel offers accommodation in single rooms, double rooms, triple room and suites up to 4 persons. All rooms are furnished with satelite LCD TV, safe and minibar. Every room has its own bathroom and toilet. Parking must be booked in advance due to limited capacity. Hotel U Svateho Jana is not suitable for the disabled.